I've lost count of the number of times i've repurchased Max Factors False Lash Effect Mascara. 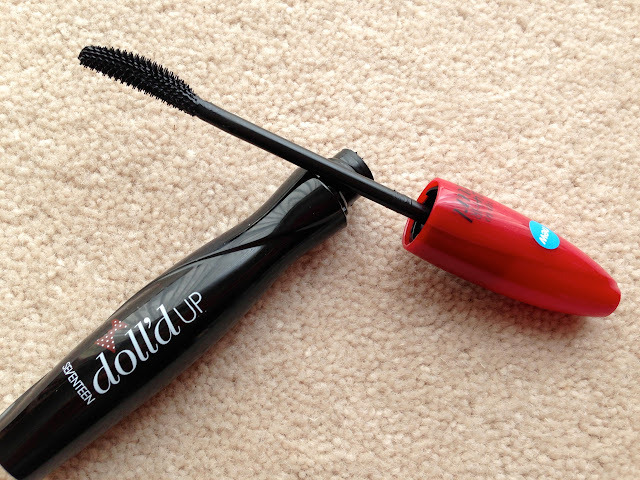 I love the effect it gives my lashes and while it's quite expensive it's definitely the best mascara i've tried. When Boots sent me a voucher to try the 17 Doll'd up mascara for £2 instead of it's usual £6.29 I thought i'd give it a go. I wasn't expecting much as i've been disappointed by so many new mascaras recently (Rimmel Lash Accelerator i'm looking at you) but I was actually quite surprised by how good it was. This mascara separates your lashes really well thanks to the thin brush and this also means it isn't too messy when you're applying it. It lasts all day and doesn't smudge under your eyes which is something i've found with a lot of cheap mascaras i've tried. I found that it takes quite a few coats to get a more dramatic effect so it's not really a mascara i'd use if I was going on a night out but it dries really quickly which is a bonus if you're getting ready quickly. I still love my Max Factor mascara so I probably wouldn't rush out and re-purchase this but for an affordable day to day mascara this one works perfectly and won't disappoint. It's also lasted me quite a while and hasn't dried up too quickly so for the price i've been really happy I decided to buy it!